You can restore the bright and vivid colour of the tiles, slabs and pathways around your property using the professional patio cleaning services which we provide. Our staff can pressure wash soiled, darkened and overgrown pathways, pavements, external walls, fences and deckings. Use our services to receive high-quality patio cleaning in Hanwell, W7 that will make your recreation areas nice and attractive. We work seven days per week and offer discounts when you book more of our cleaning services. Call to explain your demands and receive a free personalised quote. 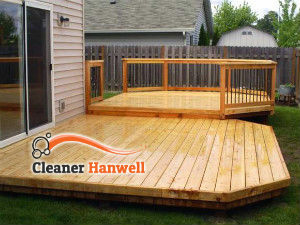 We specialise in professional patio cleaning to customers in Hanwell and in the nearby areas. We can transform your patio from a dark, gloomy and unsightly area into a bright, clean and pleasant place to spend you free time in. Just give us a call and we will do what it takes to remove mud, stains, moss, weeds and algae. Our technicians undergo professional training to learn how to work with jet washers and achieve best results. They are up to date with the latest and most effective methods for sanitising patios. Contact us over the phone, by e-mail or online to specify your requirements and get your free quotation. Harsh outdoor elements and weather condition can cause all kinds of damages and soiling of your paved, tiled, brickwork and other kinds of patio. To keep it well sanitised at all times use our patio cleaning services, available in W7 and you won’t regret. Our cleaning staff are proficient, skilful and can consult you what sealants and detergents to use to keep your tiles and slabs non-slippery, protected from moss, algae and weeds. 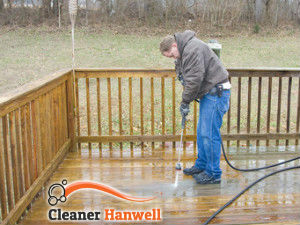 They can recommend you how often to have your patio washed and implement the work.